An American flag that has been discolored with art materials to give the impression that it was burned is currently hanging up at the University of Dayton, The Daily Caller has learned. The flag is hanging near the art department on the second floor of Dayton’s Fitz Hall — one floor above the university police department. Defiled American flag passes as “art” at Dayton University. Photo provided by a Dayton University student on the condition of anonymity. 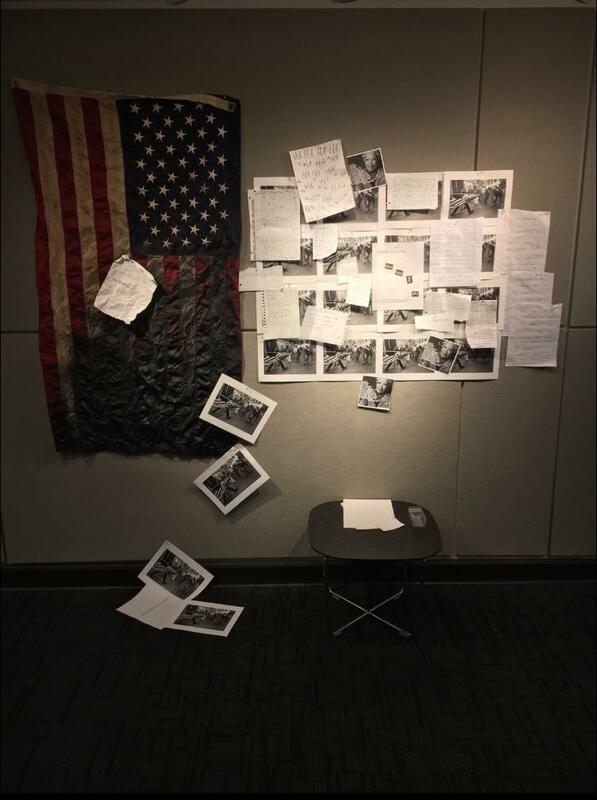 Pictures of the exhibit provided by a student on condition of anonymity show a “burnt” American flag, accompanied by several pictures and notes, many referencing Trump and the 2016 election. Judith Huacuja, who chairs the university’s department of art and design, told TheDC that she didn’t know who originally hung the flag, or whether the university would take it down. Huajuca added that the flag was not actually burned but that the perpetrator (or perpetrators) colored over the flag with art materials to give the impression that it was. She mentioned that some students are upset by Trump’s “hateful language” but couldn’t say for sure whether a student or professor was ultimately responsible. Other students, Huajuca said, are upset about the defiling of the flag. Huacuja said the university plans to have a “discussion” about the display. If the perpetrator comes forward, Huacuja said, the department may ask that they use a different “symbol” to express what they are feeling. Huacuja did not say what the department will do if the person or persons refuse to use something other than the American flag to express their dismay.